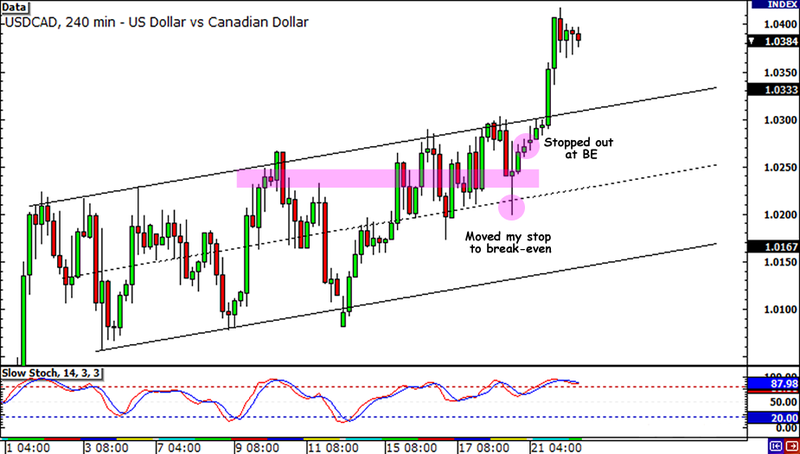 Shorting USD/CAD at the Top of the Channel – Avoided a heartbreak! So much for wishing and waiting! After finding support at the 1.0200 area, USD/CAD bounced right back to my entry point and rallied even higher. Thank goodness I moved my stop to breakeven! In retrospect, I probably should’ve just locked in whatever profits I had instead of crossing my fingers and holding on. Risk aversion was pretty strong during the last few days of the week as downbeat reports from the euro zone just kept coming in. As I pointed out in my latest Comdoll Weekly Replay, traders were focused on the bond auctions that were taking place in Italy and Spain, which highlighted the looming possibility of a debt contagion. Oh well, you can’t blame a girl for trying, can you? I guess I was just really determined to erase my losses from my previous trade that I held on to my USD/CAD short even though there were some technical and fundamental signs telling me to jump out of the trade. Remind me next time not to be so greedy again, okay? You know where to catch me! After AUD/USD showed me who’s boss in my last trade, I’m now focusing my happy vibes on USD/CAD. If you squeeze your 1-hour chart just a bit, you’ll see that USD/CAD has been trading inside a shallow rising channel between the 1.0200 and 1.0080 handles since the start of the month. However, if you zoom in on the past couple of days, you’ll also see that the 1.0270 area has served as the new resistance area for the pair. And that’s where I was able to enter! A couple of hours ago I noticed a potential evening star pattern while the pair was hanging around the area, with a bearish divergence and overbought stochastic signal also supporting a bearish trade. I was able to get in at 1.0270 with a tight stop at 1.0325. I placed my first profit target at the potential mid-range support at 1.0150. I have to watch my trade closely though. Risk aversion is still in vogue in the markets, and with France and Spain holding their bond auctions and Greece’s Papademos up for a confidence vote, there are plenty of chances that the comdoll bears would attack for another day. Of course, I will also keep tabs on the U.S. CPI and crude oil inventories reports in the U.S. session in case they turn out positive for the Greenback. 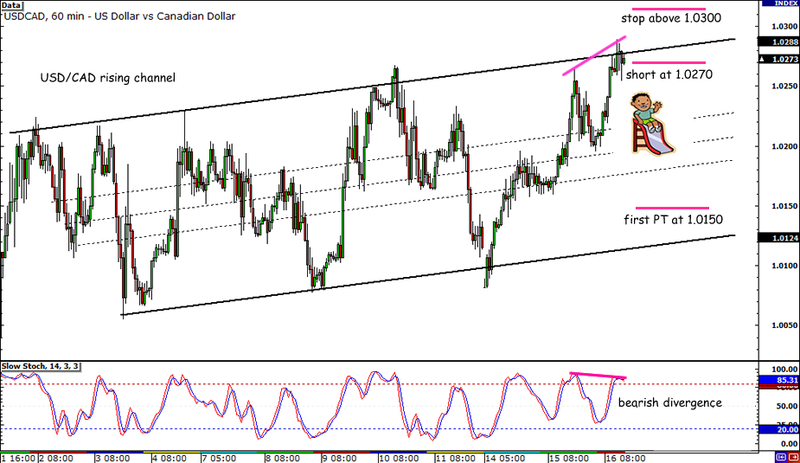 Short USD/CAD at 1.0270, stop loss at 1.0325, first profit target at 1.0150. I will be risking 0.75% of my account. What do you think of my trade idea? Is my technical setup enough to withstand the potential volatility, or should I make a few tweaks in my trade? Should I trail my stop this time? Any advice on one of the pages below will be much appreciated! Chips, dips, and pretty please give me some tips!